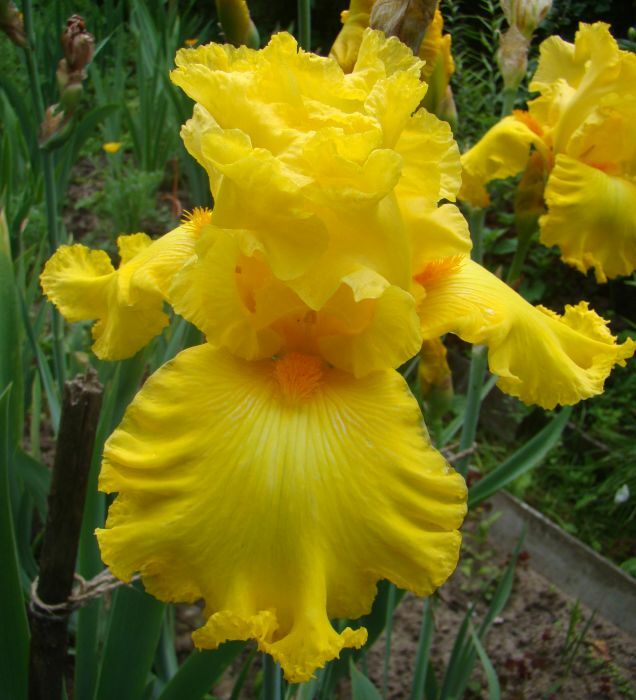 'Amarillo Frills' ( Ben Hager, deceased, by Cooley's Gardens, R. 2002). Seedling # 6275LcDpY. TB, 37" (94 cm). Early midseason bloom. Laced yellow self; beards yellow. Seedling # 5581RfTY: ((seedling #T4590TPk/Y: (seedling #T3893TY: (( 'Liz' x seedling #T2743A: (( 'Minnesota Glitters' x 'Flaming Star') x ( 'Minnesota Glitters' x 'Spanish Gift'))) x ( 'Pink Persian' x seedling #T2743A)) x 'Flaming Victory') x seedling #T4589Pk/Y, 'Fascinator' sibling) x (seedling #T4814Mv/Y: (seedling #T3696Br/BsRf: (( 'Conversation Piece' x (((Babson seedling #J14-10: ( 'Inca Chief' x 'Innuendo') x 'Brass Accents') x 'Golden Bonanza') x 'Tucson')) x 'Spiced Honey') x (seedling #T3696CpBr x seedling #T3933DpBr, 'Verismo' sibling)) x seedling #T4594TBrB: ( 'Flaming Victory' x seedling #T3893TY))) X seedling #T5536TDpY: (seedling #T5034-OrDpst: (( 'Golden Brilliance' x 'Perfect Accent') x 'Good Show' sibling) x seedling #T4589Pk/ApGd, 'Fascinator' sibling). Cooley 2002. Honorable Mention 2004. From AIS Bulletin #325 April 2002 Introducing AMARILLO FRILLS (Hager '02) M. 38". $40.00. Abundant lace is lavishly displayed in this latest Hager introduction. Clean, brilliant, intense yellow gold color is flawless. Matching yellow beards are centered on ultrawide falls. Seven to nine buds on well- branched stalks. SDLG T6275 LcDpy. Cooley's Iris Gardens. jpg 20170610_081846TB Amarillo Frills (2buds).jpg manage 157 K 24 Apr 2018 - 01:41 HollyJohnson2017-04-01 Buds of TB Amarillo Frills, photos taken on 6/10 and 6/16/2017. Photos taken by Holly Johnson at the Minnesota Landscape Arboretum, zone 4b.